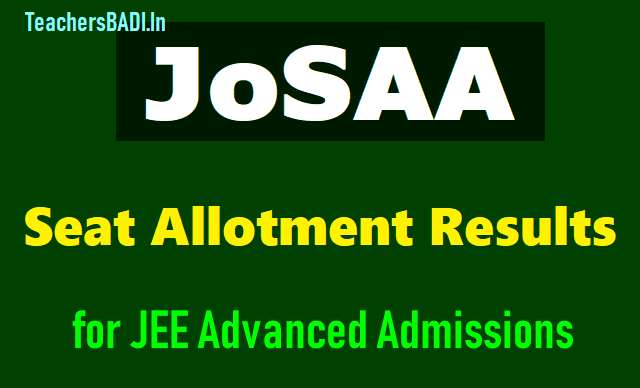 JoSAA 2018 Round 3 Seat allotment results on josaa.nic.in for JEE Advanced Admissions / JoSAA to release second round seat allotment results 2018: JoSAA 2018 3rd Round Seat allotment results on josaa.nic.in for JEE Advanced Admissions. JoSAA 2018 Round 3 seat allotment result to be declared on josaa.nic.in, JoSAA important dates for counselling: Joint Seat Allocation Authority, JoSAA, which is conducting the seat allotment process to undergraduate programmes at IITs, NITs, IIITs and GFTIs this year, has released the JoSAA 2018 first round seat allotment result, as scheduled. JoSAA round 1 seat allotment result 2018 has been announced and is now available to be checked by the candidates on the official website josaa.nic.in. After Madras High Court stayed the order to redo the JEE Advanced 2018 rank list yesterday, Joint Seat Allocation Authority, JOSAA has declared the result for third round seat allotment. The JOSAA 2018 counselling third allotment result is now available on the official website, josaa.nic.in. An official notification available on the website earlier stated, “Seat allotment, document verification and acceptance of seat is in abeyance until appropriate orders passed in a writ appeal by Madras High Court on July 2 are received by the IIT K”. JoSAA 2018 third allotment result was released today after Madras High Court stayed the order directing IIT Kanpur, the organising body of JEE Advanced examination to re-issue the rank list after giving priority to candidates who mentioned numerical values rounded off to two decimal notations in their solutions. Step 2: Alternatively, click on the direct link given here. Step 3: A new window would open. Step 4: Enter JEE Main Roll number and password. Step 6: Your third allotment result would appear on the screen. JoSAA is the JEE Advanced 2018 counselling conducting body for admission to seats available in IITs, NITs, IIEST, IIITs and Other-GFTIs for the Academic Year 2018-19. Meanwhile, the result of the first round of counselling was released on June 27. The counselling process is being held for about 36,000 seats in 23 Indian Institute of Technology (IITs), 31 National Institute of Technology (NITs), 23 Indian Institute of Information Technology (IIITs) and 20 government funded technical institutions (GFTIs). This includes 23 IITs, 31 NITs, 23 IIITs and 20 Other-Government Funded Technical Institutes (Other-GFTIs). *First Round*: JoSAA schedule, important dates are given below. Steps and direct link to the website to check the result has been given below. JoSAA opening and closing rank and seat allotment statistics are also now available on the aforementioned website and on direct links below. Institute wise allotment of seats in the Academic programmes is now also available on the link below. More than 30,000 students were eligible for JOSAA counselling registration after the extended merit list was released on June 15. Document verification and seat securing process will be done at the reporting centres from June 28 to July 2, 2018. Step 1: Log on to josaa.nic.in. Step 2: Click on the tab saying “Round 1: View Allotment Result and Pay Seat Acceptance Fee” being highlighted with a blip saying new. Step 5: The result would be displayed on the screen. Step 6: Save and print, if selected, would be required at the time of counselling. Joint Seat Allocation Authority, JOSAA 2018 has been established by the Ministry of Human Resources Development, MHRD to regulate and manage the joint seat allocation process for admissions to 100 institutes including 23 IITs, 31 NITs, 23 IIITs and 23 Other-Government Funded Technical Institutes for the academic year 2018-19. *First Round*. About JoSAA: The Joint Seat Allocation Authority (JoSAA) has been set up by the Ministry of Human Resources Development (MHRD) to manage and regulate the joint seat allocation for admissions to 97 institutes for the academic year 2017-18.